Update: Our book on the work of François-Edmond Pâris, "Selected Plates from Souvenirs de Marine" is now available! Our book contains more than 90 plates from Souvenirs de marine. 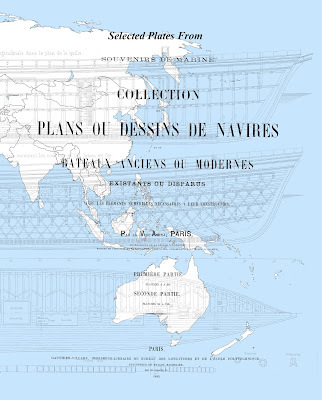 Collection de plans ou dessins de navires et de bateaux anciens ou modernes existants ou disparus avec les éléments numériques nécessaores à leur construction. More than 130 ship plans are included ranging from ancient vessels to late 19th Century. There are warships, merchant vessels, fishing vessels, and small craft from Europe, Asia, Africa, and the U.S. The plates are indexed by plate number, illustrated vessel type, named vessel, and by country/region. The book also includes an appendix "How to Read a Ship Plan" to help the novice understand the lines used to illustrate in two dimensions the shape of a three-dimensional ship. The book is available now on Kindle and should be available on Amazon sites worldwide within a week.